For other uses, see Pinner (disambiguation). Pinner was originally a hamlet, first recorded in 1231 as Pinnora, although the already archaic -ora (meaning 'hill') suggests its origins lie no later than c.900. The name Pinn is shared with the River Pinn, which runs through the middle of Pinner. The oldest part of the town lies around the fourteenth-century parish church of St. John the Baptist, at the junction of the present day Grange Gardens, The High Street and Church Lane. The earliest surviving private dwelling, East End Farm Cottage, dates from the late fifteenth-century. Pinner contains a large number of homes built in the 1930s Art Deco style, the most grand of which is the Grade II listed Elm Park Court at the junction of West End Lane and Elm Park Road. Pinner has had an annual street fair held in May since 1336, when it was granted by Royal Charter by Edward III;. Pinner is one of few places in the United Kingdom that still holds an annual fair, and it remains popular. Harrow Council has been governed by the Labour Party since 2014. Pinner has two wards, Pinner and Pinner South, each represented by three councillors. Pinner is in the Brent and Harrow constituency for the London Assembly which has been represented since 2008 by Navin Shah (Labour). Since the 2010 general election, Pinner has been part of the new Ruislip, Northwood and Pinner parliamentary constituency represented by Nick Hurd (Conservative). Pinner is part of the London European Parliament constituency which elects nine MEPs by proportional representation – currently three Conservative, three Labour, one Liberal Democrat, one Green and one UKIP member. Pinner is both a religiously and culturally diverse area, with the ethnic minority population having grown significantly since the 1970s. 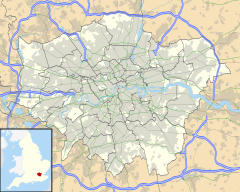 Pinner ward nonetheless has the highest concentration of people describing themselves as White in the London Borough of Harrow, at 62 per cent of the population in 2011. Pinner South ward has the next highest proportion of White people at 59.4 per cent. A local synagogue and various churches serve the religious needs of the local community. Pinner's St John the Baptist parish church was consecrated in 1321, but built on the site of an earlier Christian place of worship. The west tower and south porch date from the 15th century. Pinner Underground station is on the Metropolitan line in zone 5. Horatia Nelson, daughter of Lord Nelson and Lady Emma Hamilton, lived in Pinner from 1860 until her death in 1881. Brian Lane (1917–1942) grew up in the village. Astronomer Sir Patrick Moore was born in Pinner in 1923. Monster Raving Loony Party leader Screaming Lord Sutch, who lived in nearby South Harrow, is buried in Pinner New Cemetery. The Poet Laureate Henry James Pye retired to East End House at the end of his career in 1811. Edward Bulwer-Lytton wrote Eugene Aram at Pinner Wood House in 1832. Samuel and Isabella Beeton lived on the Woodridings estate between 1856 and 1862, during which Mrs Beeton's Book of Household Management was published. The novelist Ivy Compton-Burnett was born in the village in 1884, and the playwright W. S. Gilbert, though he did not live in Pinner, was a magistrate there from 1893 onwards. Another Victorian food writer, Agnes Marshall, whom most credit with the invention of edible ice cream cones, had a country home there and died there in 1905. Twentieth-century figures include the cartoonist William Heath Robinson, who lived in Moss Lane between 1913 and 1918 (and now has a museum dedicated to him at West House in Pinner Memorial Park), and the former Children's Laureate Michael Rosen, who writes children's books such as We're Going on a Bear Hunt, lived in Pinner from the time he was born in 1946, until 1962. Sir Elton John, who was educated at Pinner Wood Junior School, Reddiford School and Pinner County Grammar School, until age 17, when he left just prior to his A Level examinations to pursue a career in the music industry; Gordon waller of Peter and Gordon who lived with his family in the house called Elton, Elm Park Road and went to St Johns prep school before boarding at Westminster public school, composer Leslie Bricusse, best known for his partnership with Anthony Newley, was born in Pinner; songwriter Tony Hatch, composer of the Petula Clark hit "Downtown" and the Neighbours theme, was born here; Bruce Welch, guitarist in The Shadows, lived in Pinner while courting Olivia Newton-John; singer Charlie Dore was born here; and Simon LeBon, vocalist of '80s pop-group Duran Duran, grew up locally and attended the Pinner County Grammar School. Actor David Suchet and comedian Ronnie Barker were both one-time owners of 17th-century Elmdene in Church Lane; actress Jane March grew up here before moving to the United States; actress Molly Weir, best remembered for her role as the long-running character Hazel the McWitch in the BBC TV series Rentaghost, lived in Pinner until her death in 2004;. Bob Holness, the former host of quiz show Blockbusters lived here. The politician Sir Rhodes Boyson lived in Pinner; Iraq hostage Norman Kember is a longtime resident of the town; Derek Bell, motor racing driver, was born in Pinner; Olympic fencer Peter Jacobs was born here in 1938, professional snooker player Martin Gould, documentary film-maker Jo Durden-Smith was born here in 1941; pop-musician Kate Nash and Sun journalist Chris Roycroft-Davis are residents. Daniel Finkelstein was a Pinner resident.Chris Stark and Fearne Cotton are also from Pinner. Four-time European Tour winning golfer Matt Wallace grew up in Pinner and is attached to Moor Park Golf Club. Pinner fair held in Pinner High Street features in John Betjeman's 1973 BBC film, Metro-Land. The BBC sitcom May to December was set in Pinner, and its exterior shots were videotaped in the High Street. During the 1990s the children's TV series of Aquila was filmed in and around Pinner, particularly at the local Cannon Lane School. Chucklevision, the Children's TV series based on the Chuckle Brothers also filmed in Pinner. The film Nowhere Boy had a number of scenes filmed in Pinner, including outside the Queens Head Pub, Pinner High street, and on Woodhall Gate, which stood in for John Lennon's childhood home. Pinner has also been the setting for the BBC sitcom My Hero and the Channel 4 sitcom The Inbetweeners. Filming for the movie The Theory of Everything took place outside the St John the Baptist Church on Pinner High Street. The 2012 film, May I Kill U? Written and directed by Stuart Urban; starring Kevin Bishop was filmed in Pinner too. He learned they were the wife and the younger sister of a surgeon living at Stanmore, who had come in the small hours from a dangerous case at Pinner, and heard at some railway station on his way of the Martian advance. Pinner has a rugby union team, Pinner and Grammarians RFC, a member club of the Rugby Football Union. It is the most junior team to have supplied a President to the RFU. Pinner also has a cricket team, Pinner Cricket Club and a youth football club, Pinner United FC. The area also has a golf course. In addition to numerous restaurants and a number of public houses, Pinner also has a thriving amateur theatre group, Pinner Players, who have been performing in the area since 1936 and currently stage productions at Pinner Village Hall off Chapel Lane. ^ Combined total for the Pinner and Pinner South wards at the 2001 census. ^ 2011 Updated Combined total for the Pinner and Pinner South Wards. ^ Clarke, A History of Pinner, p.34. The church was originally a chapel of ease to St Mary's Church in Harrow, and was first mentioned in 1234. It was rebuilt in the early fourteenth-century, and rededicated in 1321. The parish became independent of St Mary's in 1766, when the first perpetual curate was appointed; not until the Wilberforce Act of 1868 did it appoint its first vicar, one William Hind. ^ www.statistics.gov.uk. Retrieved 14 August 2008. ^ European Parliament official site. Retrieved 14 August 2008. ^ a b "Pinner Guide". AllInLondon.co.uk. Retrieved 14 March 2012. ^ Muir, Hugh (8 July 2016). "Black flight: how England's suburbs are changing colour". The Guardian. Retrieved 5 December 2016. ^ "A look at Harrow's wards: 2011 Census second release". Harrow Council. February 2013. Retrieved 5 December 2016. ^ www.bbc.co.uk. Retrieved 13 August 2008. ^ Pinner Local History Society. Retrieved 13 August 2008. ^ Britannica Online Encyclopedia. Retrieved 12 August 2008. ^ Views of W. S. Gilbert Archived 25 October 2006 at the Wayback Machine. Retrieved 12 August 2008. ^ ":: Michael Rosen - The Website ::". ^ Elton John official website Archived 15 July 2010 at the Wayback Machine. Retrieved 12 August 2008. ^ www.yuddy.com. Retrieved 12 August 2008. ^ www.tv.com. Retrieved 13 August 2008. ^ The Gazetteer for Scotland. Retrieved 7 August 2008. ^ BBC Kent: Profile of Bob Holness. Retrieved 13 August 2008. ^ 'No word on fate of Iraq peace hostages', The Independent, 12 December 2005. Retrieved 14 August 2005. ^ Obituary of Jo Durden-Smith, The Independent, 5 June 2007. Retrieved 14 August 2008. ^ The Lord Finkelstein, OBE, Debrett's. Retrieved 14 November 2013. ^ The Best of Betjeman (2000 ed.). Penguin Books. p. 228. ^ Campbell, Mark (28 August 1999). "Torquay: the horrible truth". The Independent. Retrieved 16 March 2011. ^ Film London. "December 2009 – Pinner High Street". Film London. Retrieved 16 March 2011. ^ addictedtoeddieblogspot. "October 2013". addictedtoeddieblogspot. Retrieved 18 January 2015. ^ Lear, Edward (1872). More Nonsense Pictures, Rhymes, Botany, etc. London: R J Bush.